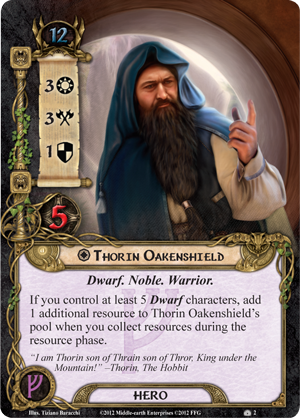 Fantasy Flight Games has posted another teaser for its new expansion of The Lord of the Rings: the Card Game. We’ve now seen several card previews from the forthcoming cardgame expansion. As always, the artwork for these cards, not based on film images, is imaginative and well-executed. As noted in earlier previous teasers, this set still requires the original The Lord of the Rings core set. Fans of the game will likely enjoy the expansion, but new players will also have to get the core set — gift-givers or new players should take note. Also note that the Shadow and Flame, completing the six-part Dwarrowdelf expansion cycle for the core game, will also debut soon. In April, the cover image of a new ‘Hobbit’ card game from game designer Martin Wallace was leaked — a very nice illustration indeed, and attributed to Ted Nasmith. Now German publisher Kosmos has announced the publication of this game for October 2012. Back in 2001, I wrote Glossopoeia for Fun and Profit (also reprinted in The People’s Guide to J.R.R. 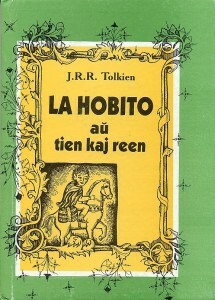 Tolkien), for our Green Books department, in which I discussed three examples of invented languages: Esperanto, Elvish, and Klingon. 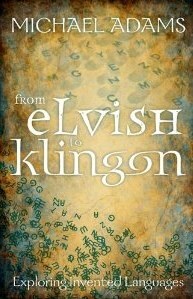 For those who found that necessarily brief article of interest, University of Indiana linguistics professor Michael Adams has now edited a new book, From Elvish to Klingon: Exploring Invented Languages (Oxford University Press, 2011), comprising eight essays (including his a general introductory essay by Adams) about linguistic invention, though not precisely the “invented languages” suggested by the book’s title, as we will see. Each essay is accompanied by an appendix by Adams that extends or clarifies some aspect of the essay. Adams’s introductory chapter deals with the spectrum of linguistic invention, and considers the motivations for such inventions. He considers whether invented languages are an attempt to re-create “the language of Adam”, i.e., a perfected language as spoken by Adam before the fall (it appears that Adams takes the Biblical texts quite literally here), and considers slang and poetry as examples of human linguistic creativity; Adams is the author of Slang: The People’s Poetry(Oxford Press, 2009). The WizKids product brand, under various owners, has been publishing the ‘HeroClix’ series of collectible miniature boardgames for several years now; they are move-and-fight combat games played on maps with miniature pre-painted figures whose movement and combat statistics are recorded on a dial that clicks to (usually) lower values as the figure receives damage. The most popular and numerous HeroClix products have been based on Marvel and DC superhero franchises, though there have been other settings as well. Their newest product is a Lord of the Rings game. There are (at present) two ways to buy: an ‘Epic Campaign’ starter set, which contains eight characters (Sauron, Witch-Kingm ‘Ringbearer’ (Frodo), ‘Esquire of Rohan’ (Merry)m ‘Guard of the Citadel’ (Pippin), Strider, Captain Lurtz, and Olog-Hai), as well as rules, six largish maps, ‘Horde’ tokens representing generic Orcs or warriors, dice, character cards, and other play aides; and the standard ‘booster’ style in which one of an initial set of 21 figures (with various degrees of rarity) and its associated character card is purchased sight unseen. 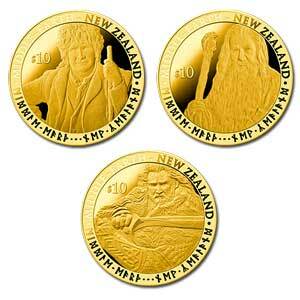 You might get a common ‘Frodo’, or a rare Gandalf the Grey. There will undoubtedly be many expansions with additional figures and maps before long. Welcome to TheOneRing.net’s Boardgame Gift Guide! Boardgames that portray Tolkien’s world have been a part of the hobby since the 1960s. Ranging from easy family games to hard-core wargames, there is something for everyone. 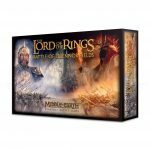 Since the merchandising license for such games can be expensive – and boardgames are not a huge mass market – there are only a few quality companies licensed to produce Tolkien-themed games. No, no, not the film — it’s a new boardgame by Dr. Reiner Knizia, who designed the recently-republished ‘Lord of the Rings’ cooperative boardgame and many other excellent titles. Fantasy Flight Games has announced this for ‘Winter 2010’. Some time back, Knizia indicated that, like the book, this will be a lighter title than ‘Lord of the Rings’ and playable by younger players and non-gamers. 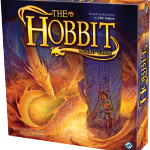 2-5 players represent dwarves who accompany Bilbo on his journey; the goal is to end the game with the most loot! With the forthcoming cooperative LotR card game and the new edition of the older Knizia LotR co-op (and a likely new edition of the big-box War of the Ring wargame next year), and now this new product, Fantasy Flight is keeping their Tolkien line very much alive. In any case, this game can keep us occupied on those long Yule nights while waiting for news about a Hobbit movie.